Whether you’re a 1st AD or in the production unit, these best practices could help prevent common mistakes that occur as you start sending call sheets to talent & crew. When building your project’s contact database, pay close attention to avoid any mistakes on entry. If an email is typed incorrectly you may not find out until after the call sheet has been sent, and you get a bounce receipt. At which point, you’ll either scramble to find another email for that person or need to call for clarification. Not ideal when it’s late and your production is trying to rest up before the next shoot day. When gathering more nuanced cast and crew details (i.e. food allergies, nearest airport, seating preferences, agent information, etc), consider creating a private survey with Google Forms instead. All submissions will be automatically saved into your Google Drive. Google Forms will automate most of the data collection process, and reduce human error. Since data is being entered by the talent and crew, the risk of spelling mistakes reduce quite a bit. Afterwards, you can port the details into a dedicated Cast List / Crew List template. Need templates to get you started? Read our article on Managing Crew Details Using a Booking Sheet (Free Template). 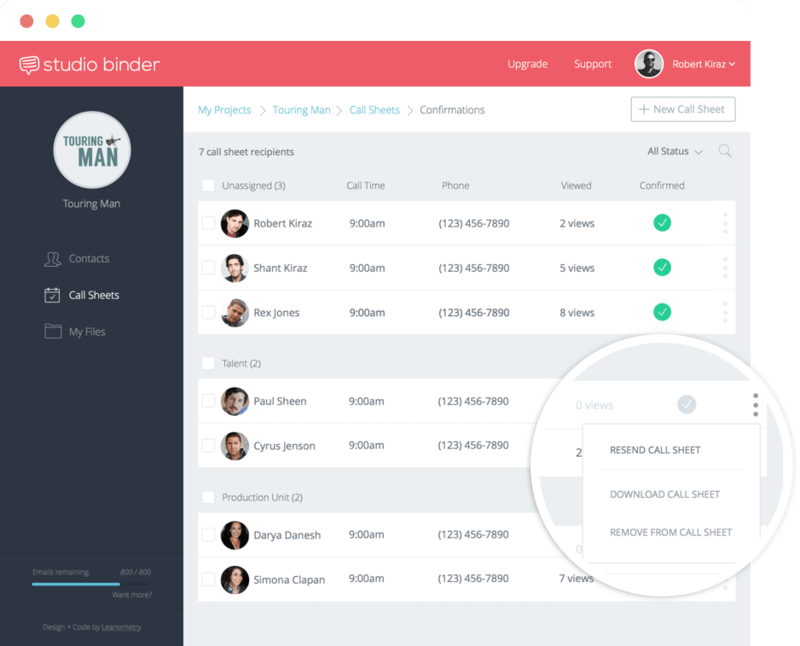 Alternatively, you could also use free production management software like StudioBinder to stay on top of contacts. Full disclosure, StudioBinder is the company that brought you this article, but we really do have a great way to manage contacts. With StudioBinder you can keep all of your talent and crew details up-to-date, and it syncs the changes across all projects. You can also group contacts into lists for easier organization and quick importing into new projects. Lastly, most call sheet software makes it easy to transition from contact management to creating, and sending, call sheets. If you’re working on a multi-day shoot, you want to avoid inputting the same information day-to-day. We recommend pre-filling all the recurring production details into your call sheet template, and then save it as a new project template to be used throughout the duration of your show. When creating a call sheet, time is limited, interruptions are constant and the pressure is high. As a result, mistakes are very easy to make. Once your call sheet is populated, we recommend getting feedback from others so any potential issues can be caught. If you are new to the process, ask someone higher up to sign off. That way you aren’t solely responsible if anything is missed. For more details on typical call sheet approval workflows read How Call Sheets are Approved on Short Form Projects and Features & Television. 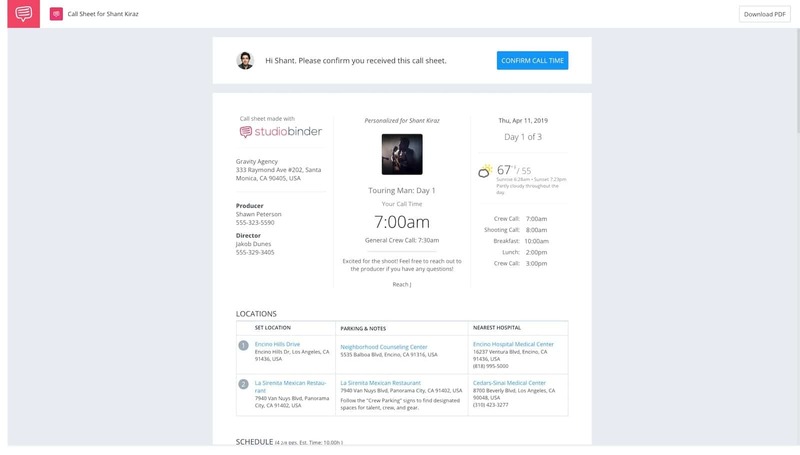 With StudioBinder, you can create and share a call sheet with “collaborators” such as your production team or clients. Collaborators view the prelim call sheet, add comments, and approve it. No need to email, print, sign off, scan, etc. Approvals are timestamped online for clear record-keeping. Talent and crew are always on-the-go, so making sure that the call sheet is easily viewable on a mobile device increases its readability. If you’re making your call sheet in a spreadsheet application, export and send your call sheet as a PDF file. PDFs are universally viewable on smartphones and are “read only.” You certainly wouldn’t want recipients modifying the call sheet. Alternatively, you can use call sheet software like StudioBinder to generate a call sheet that is optimized to load on mobile devices as well as desktop. So you just sent out the call sheet. Time to get some rest, right? Not yet. You still need to confirm that everyone received their call sheet. If an important cast or crew member does not view or receive the call sheet, the next day’s shooting schedule may be compromised. Even if you make this line big, bold and red, you’d be lucky if any more than a handful of people confirm receipt. This is why a PA or coordinator would be tasked with following up unconfirmed recipients to ensure they received their call sheet. As you can imagine, this is messy, drawn-out process, but it’s necessary to ensure everyone shows up to set. This is why we made sure that StudioBinder would automatically tally the call sheet views and confirmations for you. That way, you only follow-up with the recipients you need to without nagging the rest of your talent and crew. Recipients get personalized emails with prominent “Confirm” button (PDFs attached). Track as recipients view and confirm their call sheets. Drill deeper for more details and follow-up with only those that need it. You can spend a lot of time creating call sheets the old fashioned way, and hope everyone gets them, that they're accurate, etc. Or you can use professional software like StudioBinder. We hope these tips were helpful. We so often focus on the actual call sheet creation process, that it’s easy to forget about all the logistics that go into the distribution process. Want to learn more? Read our companion article on How to Create a Better Call Sheet. Have any other tips or suggestions? Let us know in the comments below.